Roasted cauliflower is one of my favorites….easy, little prep time, and a pretty mild flavor which results in minimal protests from my kids. Give it a try! Spread florets into a single layer in a 9×13 baking dish, or onto baking sheet covered with foil (if making 2 heads you’ll need two dishes/sheets). Drizzle 1-2 tablespoons of olive oil over florets, then gently toss to coat. You want a light coating of oil, not a heavy layer. Place in oven on middle rack, and roast 15 minutes. Remove from oven, toss gently, then return to oven and roast another 10-15 minutes, or until tender and some surfaces are browned. Remove from oven, salt to taste and serve. 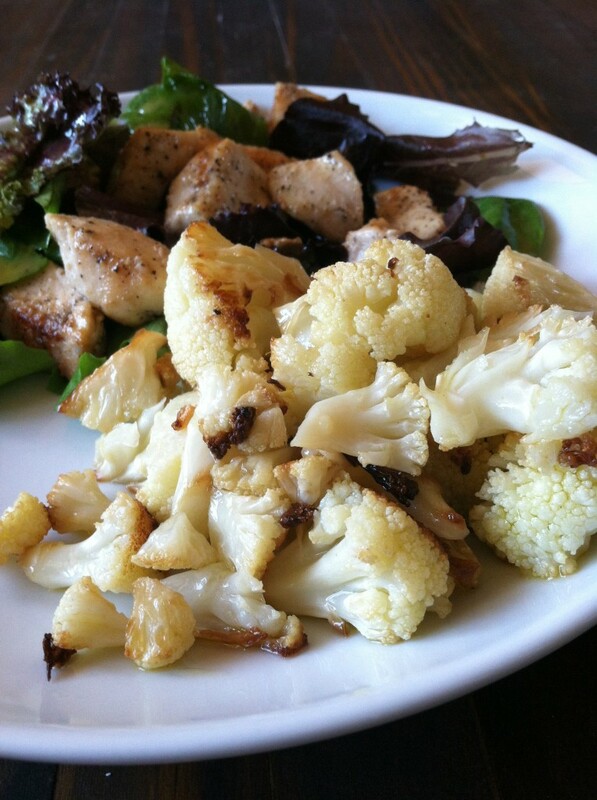 I like quite a bit of crispy brown on my cauliflower….that caramelized flavor really helps win over the kids as well. A squeeze of lemon or a sprinkle of parmesan cheese is also yummy.